This Active IQ Level 4 Management of Lower Back Pain course is a high level qualification that provides the key skills, knowledge and pathway to becoming a Level 4 Exercise Instructor specialising in managing lower back pain. This qualification has been developed and written by leading industry experts in the management of lower back pain and the tutors presenting this course will be highly experienced in this field. Personal trainers often come across clients that have chronic lower back pain and this course will provide the foundations to be able to assist those who deal with this condition. Please be aware that to complete the Lower Pain Management Level 4 course you need to have Level 3 PT and Level 3 Exercise Referral qualification. The course is 100% online, each tutorial can be downloaded into MP3 so you can learn anywhere, anytime. The online tutorials link directly to your course manual which is posted upon enrolment and structures your entire learning journey. You will complete a case study and submit a video practical assessment for full course certification. What support will I get and how long does it take to complete? You will be supported throughout your studies with weekly calls to suit your needs. The quickest someone has completed this course is 2 weeks, with the average learners spending 8 weeks to complete. There are a number of assessments covered on this course. Yes this course can be found on the national Qualifications and Credits Framework (QCF) website meaning that this is recognised across the UK and hold 16 REPS points. Become a Level 4 specialist, accelerate your knowledge of prevention and treatment for Low Back Pain. What is the Level 4 Low Back Pain Qualification? Download Every Video Module to MP3 - Now you can learn anywhere, anytime! 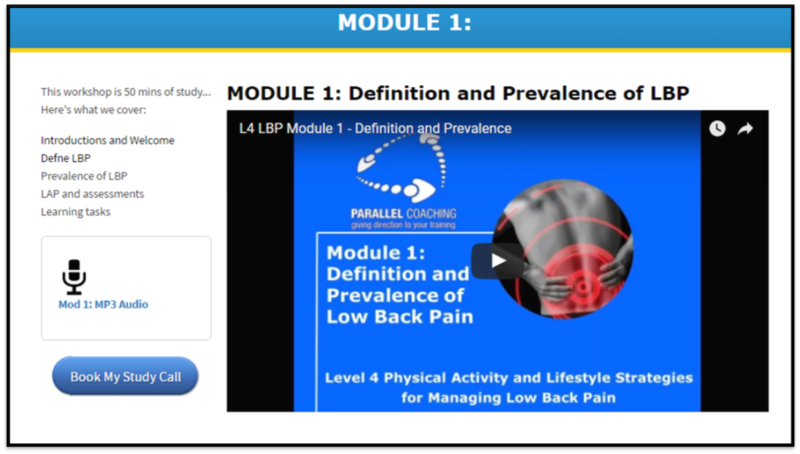 What are the 6x Level 4 Low Back Pain modules? Each video module is specifically mapped to your level 4 Low Back Pain manual and the leading awarding bodies: Active IQ. The Level 4 Management of Lower Back Pain Qualification is £499 u̶s̶u̶a̶l̶l̶y̶ ̶£̶5̶5̶0. Full payment can be taken below or you can call us today to enrol. 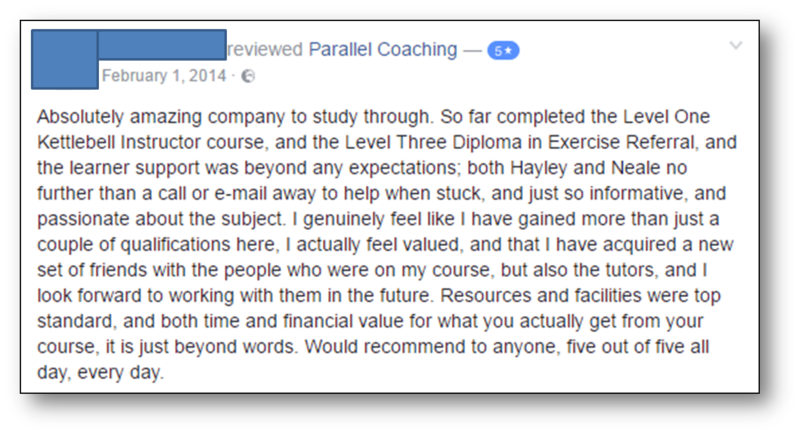 Parallel Coaching offers a payment plan; Pay a minimum of £100 deposit and pay NO INTEREST on the balance across 2, 3 or 6 months. All 6x full HD video modules, Active IQ course manual, Instant Learning Hacks, MP3 downloads, and unlimited student support and lifetime access. Sign up and pay below below using a secure international payment gateway, offering you security and an instant receipt of payment. We'll be in touch immediately to complete your enrollment, set up your personal online login and ship your course manual. Or book a call below, with Hayley from Parallel to answer any further questions. Pay £499 u̶s̶u̶a̶l̶l̶y̶ ̶£̶5̶5̶0 below OR click the deposit only button to secure your course for £100. 2) Add your card details, click "add £499"
You will learn everything you need to become an effective Low Back Pain Specialist. Each module is approximately 1 hour long; not only explaining the physiological “Ins & Outs” of posture and pain management, but explained with analogies and client stories to spark your instructor creativity and effectiveness. You will learn everything required to pass the qualification, and a lot more beside, so you leave confident and ready to train clients in the prevention and treatment of low back pain immediately, through the guidance of your experienced tutor. It is essential that you have completed your Level 3 Exercise Referral Qualification (or working towards it). A discount is available if you wish to purchase both the l3 exercise referral and level 4 low back pain qualifications, through us at Parallel Coaching. Speak with your tutor on your enrolment call for more details. We do accept Exercise Referral certification competed with alternate training providers, however we will need to see proof of completion; and depending on date and syllabus of the qualification, we may need to double check your eligibility, which is usually just a quick check. You need to be passionate about working with low back pain and posture. You need to have access to the internet and have a UK address. What can I do after qualifying? As a Level 4 Low Back Pain Specialist you can expand the work you currently offer with clients, start a new project, strengthen your specialist brand, work within an exercise referral scheme and link with health care professionals. Level 4 is the highest qualification level within the health and fitness industry at the moment. However, many students enjoy learning the level 4 syllabus so much that they then enrol onto the level 4 obesity and diabetes qualification. Maybe you have had your own back pain journey, or just have a fascination with posture ,technique and/or pain management. Maybe you find yourself attracting a certain type of client, and have a lot of clients that are suffering from low back pain. If you have used one of our previous Revision Mastery Series or studied with us before, then you know that our teaching is clear and easy to understand. We also offer 24/7 support, so you can call your tutor whenever you need help with your studies. This course adapts to your learning style and offers accountability to help you learn inside the deadlines you set yourself. Yes, all of the resources are housed on our secure membership area, so you will need internet access to gain access to the modules, and supporting documents. HOWEVER you are able to download each video straight to MP3, allowing you to save it to your phone/ tablet/laptop and listen over and over, even without internet access. You will also get a physical manual through the post, and guidance support via telephone and email throughout. Lots of students have used this when working out, driving, going for a walk… You can save time, so there is no excuses stopping you from completing the qualification and accelerating your fitness knowledge.